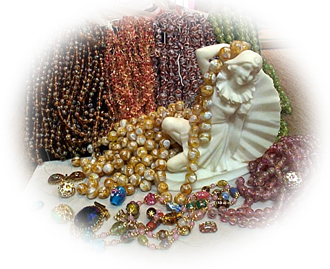 Your online Bead Store specializing in Vintage Beads, Jewelry findings, Clasps, Glass Beads, Vintage Glass Stones, Bead thread and Beading Supplies. A great selection of Vintage Glass Beads await your viewing, and equally a large selection of New Glass Beads, Pewter beads and charms, Gemstone Beads and hundreds of shapes and sizes of Vintage Glass Stones, Cabochons and Rhinestones. 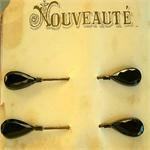 Antique Bead Peddler also carry a large assortment of new and Vintage clasps. Clasps set with Rhinestones, Pearls, and Gemstones, even Clasps that carry 1 to 4 strands of beads. 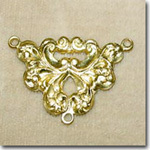 Fabulous Metal Stampings that range from Art Deco motifs to metal stampings of filigree and classic victorian patterns. Be sure to check out the Pewter selection, Pewter pendants, charms and jewelry links await your viewing. 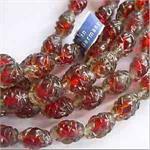 Enjoy browsing thru our New Glass Bead section and keep in mind our new beads are stock from 1986 and our vintage beads are much older. Victorian Ornaments worn on period clothing and hats are a special warehouse find. These victorian ornaments are limited in stock and a great addition for those collecting period hats and clothing. View our Antique Jewelry section for lovely necklaces, brooches, and earrings and other Antique Jewelry items. Look us over, you are sure to find something that will be just the perfect item that you are looking for. 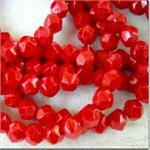 Stop by often to see new additions to our vintage beads, new glass beads and jewelry findings. When you find an item in the store that you would like a closer view of please click on that picture for an enlarged version and detailed description of that item. Red & Smoke patterned Vintage glass beads from Western Germany. 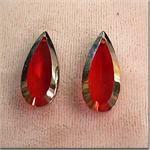 Oval shape with a pretty pattern that enhances the red color imbedded in the glass. 12x8mm - 25 piece strand. 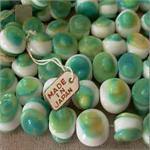 Beautiful transparent emerald green Japan vintage glass beads. 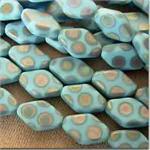 Each bead has a colorful floral pattern around bead surface. Bright green color compliments floral pattern. 10x10mm square. 25 piece strand. .
Iridecent eyes on matt turquoise glass,12x8mm flat bicone shaped bead. Fabulous coloring. 25 pieces. 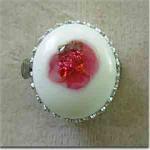 Vintage clasp, 1 strand, white glass cabochon with red foiling. 15mm. 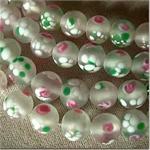 Delicate pink roses and green foliage decorate these frosted lovely vintage Japan beads. 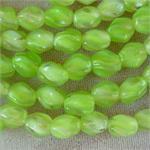 10mm - 25 pieces per strand. Jet glass with one end that screws open to apply thru fabrics. Great warehouse find of original pins. 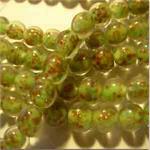 10mm vintage venetian glass beads, crystal with peridot lined with flecks of gold stone. 25 pieces. 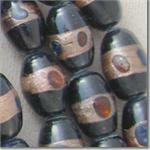 Vintage West German Fire polish beads, dark aquas and sapphires blended into glass. 8mm 30 pieces. 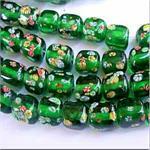 West German glass beads. Peridot transparent glass with cream lining. 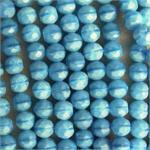 9x6mm - 50 pieces per strand. 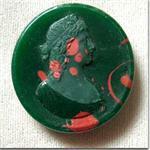 28mm Round glass Green Bloodstone Cameo. Groove on edge for wire wrap or mounting in bezels. Black oval glass with applied red and blue glass dots. 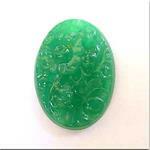 10x8mm - 25 pcs. Ruby Red vintage jewelry pendants with a gold trim. 16mm long. Sold by the pair. 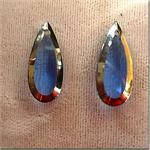 Sapphire Blue vintage glass Pendants with a gold trim. Sold by the pair. 16mm long. 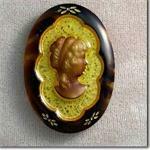 Large 30 x 40mm Tortise glass cameo, embossed enameling and raised glass cameo head. 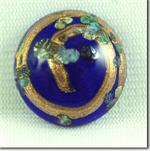 18 mm Cobalt Blue glass flatback stone , venetian style, with bronze decor. 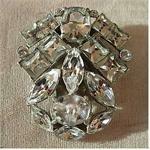 Large Rhinestone Dress & Hat Clip, 1 3/4 inch. Perfect condition. Lots of rhinestone dazzle. Gold Plated Jewelry stamping. Vintage turn of the century styling. 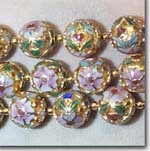 Large 12mm Gold Cloisonne enameled floral beads. 8 pieces per strand. Very beautiful designed metal beads. Handmade glass. Blue with a touch of gold in each bead and pink floral design. Very pretty. 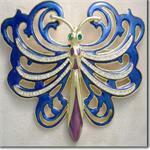 31/2 in Enameled Pin with crystal rhinestones in Dragonfly wings.